I love to meal prep. Nothing makes me feel more “on top of things” than a good ol’ Sunday morning meal prep (exercise, a full fridge and clean house are very close seconds). However, life happens and even I fall off the wagon. It’s hard cutting up a butternut squash when your 10-month-old keeps putting dog food in his mouth, let me tell ya. So, when I don’t get the time to focus on my food prep, I do what any normal person would do – go to the drive thru. Kidding! While the temptation of any sort of carry out sounds appealing, I don’t have the money or stomach for all of that garbage. I just look for even better short cuts! Pre-cut/pre-washed veggies are a lifesaver. Yes, they cost a bit more because the work is done. However, I would much rather pay for that than put something not so healthy in my pie hole or stay hungry. I can turn the oven on, dump the veggies onto a tray and slide the tray into the oven with a baby on my hip. No excuses. Hard Boiled Eggs. 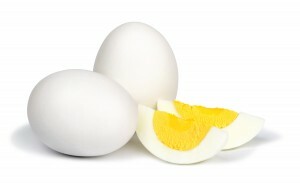 If you cannot eat eggs or just don’t like them, then this go-to snack will not help. But, for those of you that love eggs like I do, this is an amazing grab n’ go protein that doesn’t even require a fork. Once the hard boiled eggs have cooled, peel them all and place them in the fridge. Everyone can boil water. Again, no excuses. Nuts. I personally like to make my own trail mix with nuts because I like to be in control of what goes into the bag. Lots of trail mixes contain unnecessary oils or sweeteners (read labels, my friends!) I recently hit up the bulk bins at Whole Foods for the first time and LOVED it. I didn’t have to commit to a whole bag of something (money saver!) and I was able to buy more of a variety! Why didn’t I do this sooner? Nut butter packets. I love these! I like to toss one (usually almond butter) in my bag while packing snacks for the kiddos. Put the nut butter on an apple or banana (again, just toss it in a bag) and you are good to go! No utensils necessary! Again, make sure to read labels. Stick to the one ingredient nut butters. You don’t want any added oils/sweeteners! There you have it! All of these snacks require very minimal/no work. Preparation is key when it comes to healthy/clean eating. Planning ahead can help you stay on track and reach your fitness goals. What are some of your short cuts? I would love to know! Karen M. Bobos, MSed, has been in the fitness industry since 1996 and feels her highest accomplishments are those results achieved by her clients through her guidance. She educates clients that there is no trick to being healthy, no magic pills, but rather optimal health is achieved through eating right and moving your body.